This is a problem I've had since Finale 2008, and updating to Fin 2012 still has not addressed this problem. Maybe there's someone out there who's run into this and knows what's happening. One of the things I do is recreate parts for groups that play in my area. I pride myself on being able to reproduce the look and appearance of various publishers' styles, so as to make things appear uniform when parts are collected. Here's what happens. In order to replicate the look of a particular publisher's style, I need certain text fonts. Sometimes that's as simple as having Times New Roman on hand, but other times, not so much (e.g., old Hal Leonard Woody Herman Series charts used URW Continental or Gill Sans, depending on the era). Anyway, I've got the text fonts I need on hand to replicate the style. I go to select those fonts from within Finale's interface for text blocks on the page. The window will display and render the font face properly but when applied, the font will display as either Arial or Times New Roman (whether the font is sans-serif or serif). Attempting to print or export the document to PDF will not result in the chosen font being rendered; it will simply fall back to Arial or Times New Roman. If I select the same element of text and try to change it again, the correct font will show up in the selection window (and will even render properly), but the words "error selecting font" will display at the bottom of the window and Finale's output will not change. While this behavior is consistent from font to font, knowing which fonts work and which don't is a chore because it seems completely arbitrary. Fonts that are produced by professional, large foundries (Adobe, Monotype, etc.) fail to work while cheap, poorly-made fonts work fine - and vice-versa. I have no way of knowing what will work and what won't. And yes, I have tried the "include printer-only fonts" option, which was supposedly a workaround for the issue. It doesn't change the way Finale behaves. The effect is not limited to text blocks, either, although with the new font-selection dropdown used for expression text, there is a workaround there. Using the character settings dialog to set the font causes the same error as before, but unchecking the box that forces the choices to be limited to the category fonts and using the drop down to directly select the desired face does work. This, however, does not fix my fundamental issue of text blocks not being formatted properly. Any ideas? I've attached two images to help show what I mean below. This image has been viewed 526 time(s). This image has been viewed 465 time(s). Sorry I can't help, but I have to ask: How do you not only recognize, but locate the fonts in question? I have emulated publications for a while, usually when someone pays me to transcribe a part (like alto clarinet to basset horn or something), but I just usually browse the fonts for a few minutes and see if I can find one that's close to the publisher's fonts. I am going to guess you are using Windows 7. Finale has had some problems with some fonts and the Windows 7 font structure. For some situations, I have discovered a workaround that works in Finale. As far as PDF, are you embedding the fonts? P.S. : I just checked my workaround and, lo and behold, it will work. My little known workaround (even MakeMusic tech support didn't know this one)? Instead of selecting the style from the list, enter all the information regarding the style in the slot for the font name. In other words, instead of selecting Gill Sans, and then Ultra Bold, add the words Ultra Bold next to Gill Sans in the first slot. Then press OK. The correct font now shows on screen. Now, when you reopen the font selection box, it will look like the usual setup with only Gill Sans in the slot, and Ultra Bold selected. However, the error message is gone. This is an issue between Finale and the Windows 7 font setup. The MakeMusic programmers could fix this, I think, but have chosen not to. i'm not even sure they are aware of my workaround. I did send them a message about it, but we've had no update fix yet. MyFonts has "WhatTheFont", a little service where you can upload an image have it identify letters, and it will do its best to locate a font that's a match. You can frequently purchase it directly from them. If WhatTheFont fails, there's a forum where you can post an image and people will look at it and try to determine it for you. Identifont allows you to answer several questions based on what you have and it will try to narrow things down. Identifont isn't quite as reliable, but it can offer good alternatives. In experimenting with your workaround, I found that it does not work all the time, in fact I would say it does not work most of the time. I do not have the extensive collection of Gill fonts that Matt has according to his images, but I do have Gill Sans and Gill Sans MT, both with several typefaces. Gill Sans Condensed Ultra Bold does not work. Gill Sans Ultra Bold does work as you described. Gill Sans Condensed Ultra Bold Oblique will crash Finale consistantly. Finale auto restarts. Gill Sans Ultra Bold Oblique also crashes Finale consistantly. Finale auto restarts. This is one of the few, rare times I have had Finale actually crash. It did auto restart as advertised, contrary to what many have reported elsewhere on this forum. I randomly chose other fonts and typefaces using the workaround. Most did not work. As Matt says, it seems to be completely arbitrary. Not even a Win 7 issue exclusively. My XP has a problem with that font. So, MakeMusic, back to the drawing board. One of the most egregious offenders: Helvetica Neue. And even standard Helvetica doesn't respond properly, with it refusing to acknowledge weights other than Medium or Bold in the list. The thing I don't understand is why the program doesn't use the OS's default font selection engine - Microsoft developed it and it works, why try to reinvent the wheel? I didn't want to create a new thread but this is still a huge headache. Can you please fix this MM? I can't select many fonts that I have installed on my Win7 machine. Latin Modern, Gil, and dozens more. I mean, we're being limited to what fonts we can use in title pages and throughout our score because MM is unwilling (unable?) to fix the communication between the Windows font manager and Finale. How is this not important? Fonts are not important for engraving, right? Oh. Wait. Just as the OP said, it displays fine in the dialog box but once you commit, the score uses some default boring font and the dialog box when re-opened says error selecting font. Please don't make me beg for basic font usability ok? :) Please? Thank you! 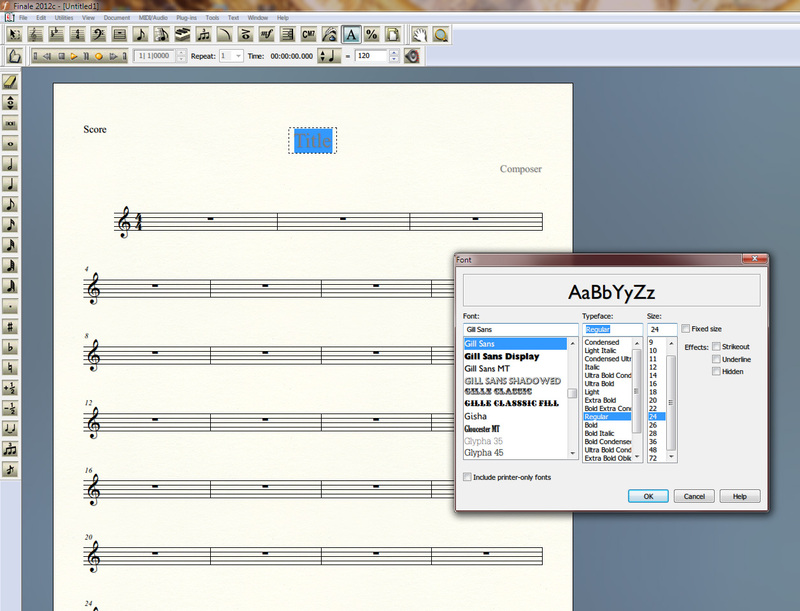 As of now I am not able to use 85 fonts on my PC, many of which are my signature engraving choices for scores. So now I am forced to use other applications for non-score pages and then link them up later. Fun! Do we even know *why* some fonts error out in Finale? Maybe if we knew what triggered the error in the font we could find replacements or save time without having to try each one? If you wish to address MM directly, you should file a support case on their web site so it can be logged and so your desires can be added to others who wish for the same fix. That is a good suggestion. Also, as many users decide to go back to a more usable version of Finale (and this is a Finale issue somewhat), I would love to go back to a more usable version of Windows (for Finale, anyway). XP handles most fonts no problem, so it's partly the OS. Unfortunately, XP is no longer being supported as of April, 2014. Too bad. It was (still is) a good OS. Thanks Z. I was more interested in trying to figure out what the actual issue is. Does using a 3rd party font manager help maybe? Also, opening a ticket is great but judging by the date of this thread (and seeing as how it goes back several versions of Finale), but do you really think it'll be addressed any time soon? I wonder if Windows 8 has the same font hiccup as 7 w/ Finale? The workaround was something I discovered some time back, but does not work for all fonts. It is partly a change in Windows font handling starting with Win 7 and Finale 2012, when MakeMusic introduced Unicode support. The fonts in Win 7 are not separate items, but a single item with multiple layers. Finale has a hard time with that in the way the Unicode support was added. If I am not exactly right about the technology or the description, it's because I am not in any way an expert in those things. I would still report it. P.S. : According to the Knowledge Base, this issue goes back to 2011 and Win 7, and was fixed in Finale 2011b. I guess they thought too many people missed the problem, so it came back in 2012. 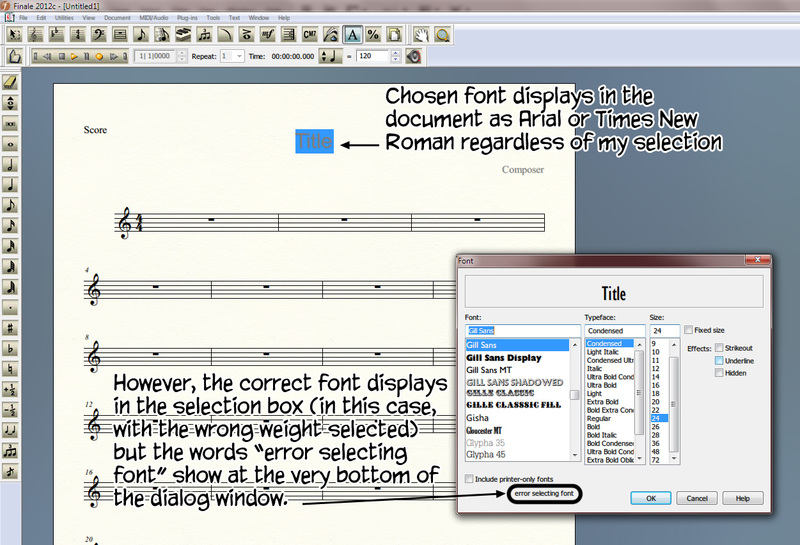 I AM SO TIRED of Finale telling me I can't use fonts I've purchased specifically for MUSIC printing for clients. When will this be fixed!?!??!?!?!?!?! Every font I buy and try to use on Finale, FONT ERROR. Looks correct in font dialog box but when I select it, YUP - good ole' SANS SERIF ARIAL OR TNR boring default Windows font in my score. COME ON. ITS BASIC FONT MANAGEMENT. Now I have to tell clients I can't print your music the way you want it because "Finale won't LET ME use fonts we've purchased for your catalog, sorry!" WHAT A FAIL. THIS SHOULD BE A TOP PRIORITY. FINALE 2014 CAN'T EVEN ALLOW YOU TO USE PROPERLY-INSTALLED WINDOWS FONTS. WHY ARE WE LETTING THIS GO!?
" Finale has a hard time with that in the way the Unicode support was added." - SO FIX IT. A PROFESSIONAL SCORE PRINTING PROGRAM SHOULD, UH, MAYBE, ALLOW FONTS TO BE USED BY PROFESSIONALS? NAW, THAT CAN WAIT. LET'S FIX OTHER STUFF. Has MakeMusic offered an official workaround yet? I had the same problem with Bulmer MT Std (Bulmer MT Std Display is picked up ok) - fixed when I entered the postscript name 'BulmerMTStd-Regular' in the font name slot. From there, it gives me a choice of four optical weights. Which may (or may not) embed the associated fonts in the output file. The only way to be sure I guess is to add all the optical weights seperately and embed these as distinct fonts/styles, and then... embed the fonts again in the output file. Goodness me, what a palaver!